A key measure of sailing performance is the degree to which you can sail into the wind-to sail to windward. A key measure of leadership performance is the degree to which you can lead organizational change-to sail your organization into the prevailing winds, often on political seas. Windward Leadership is about leadership and leading organizational change. Leaders at all levels who aspire to more than just reducing costs, leaders who aspire to building organizations that add value and create competitive advantage, will take pages from Ruprecht’s book of wisdom gleaned from his long and distinguished international career building new organizations, renovating under-performing ones, and revitalizing those that have been neglected. With clear and sometimes provocative language, Ruprecht writes with a distinctive voice. Weaving together helpful analogies, metaphors, and good sense, Ruprecht shares his own experience and lessons learned applying the counsel of leading experts in the areas of leadership and organizational dynamics. Moving quickly from theory to pragmatic issues, Ruprecht shares key lessons, and provides concrete tools and methods for turning principle-centered leadership and team-oriented management into operational action. Ruprecht’s pragmatic approach remains unconstrained by today’s conventional thinking. A manifesto for change from the middle out, Ruprecht’s message is designed to open leaders’ minds and steer them away from the dysfunctional habits, assumptions, and tendencies that are prevalent in today’s typical organizations. It is the necessary journey, and it is one filled with both adversity and adventure. 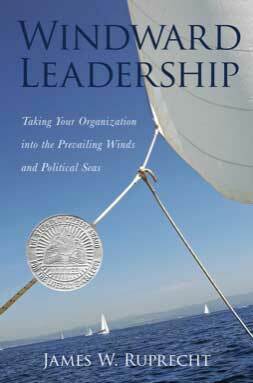 Whatever the prevailing winds and political seas in which you sail, whatever kind of organization yours may be, no matter where your organization may be in the hierarchy, no matter how big the organization you lead may be, Windward Leadership will help you make that corner of the planet, which you have the good fortune to lead, a better place. 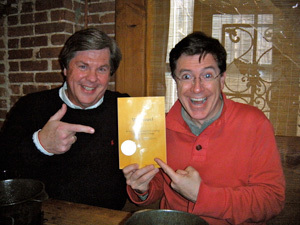 Stephen Colbert nominates Windward Leadership for The Stephen T. Colbert Award for The Literary Excellence.